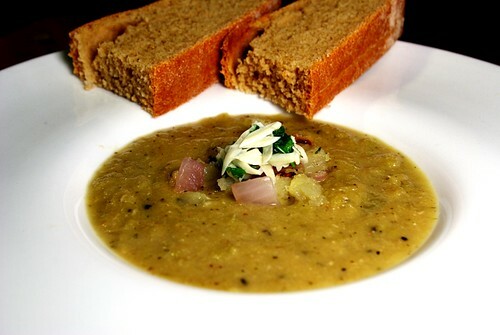 pureed broccoli stalk soup with roasted potato parsley and lemon garnish with fresh white whole wheat boule, originally uploaded by aarn! +23rd June, 2009+. trisha salvaged a bag of broccoli stalks from her place of work yesterday and made this delicious soup. she sliced the broccoli stalks into 3/8-in thick rounds, tossed them in some olive oil, salt, pepper, celery seed, and fresh basil, then roasted them in a 400-degree oven until nicely browned. added the broccoli to a stock pot with onion, garlic, and celery, which had been slowly sauteed in olive oil (soup day is a bad day to be out of butter). braised the broccoli in some amontillado sherry, and pork and fig stock (yes, that's right, it was in the freezer from the fig braciole dish. it was the braising liquid.) for an hour or so, until fully tender. blended the contents of the pot until smooth and added some more pork and fig stock, some water, 1/2c. or so of buttermilk, and let simmer for a little while longer. tossed some cubed potatoes and diced red onion in some fresh parsley, garlic, salt, pepper, and olive oil. roasted in a 400-degree oven until tender. mixed together lemon juice, shredded parmesan, and fresh parsley. mixed 1T. of dried yeast into 2c. of room temperature water (let stand for a few minutes). while mixing added 2t. sugar, 2/3c. olive oil, and 3t. salt, then slowly added 1.5-lb white whole wheat flour, then removed from the mixer and kneaded by hand until smooth, cut into two pieces, shaped into a boule, and let rise on parchment paper on a baking sheet for an hour. baked on a middle rack in a 400-degree oven for 30-minutes, with humidity (spray and bath), rotating a few times, then let cool on racks for 30-minutes. served the soup in some large-rimmed soup bowls garnished with some of the roasted potatoes, and drizzled with some of the lemon juice, parmesan, and parsley mixture, with a slice of the fresh boule on the side.